The chapter starts with a bang–literally–as Hagrid stomps his way into the shack where the Dursleys have holed up with Harry. The Keeper of Keys and Grounds of Hogwarts is decidedly unimpressed by any of these Muggles, or how Vernon’s whipped out a rifle to try to ward him off. A giant of a man was standing in the doorway. 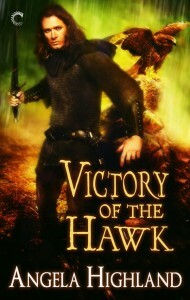 His face was almost completely hidden by a long, shaggy mane of hair and a wild, tangled beard, but you could make out his eyes, glinting like black beetles under all the hair. 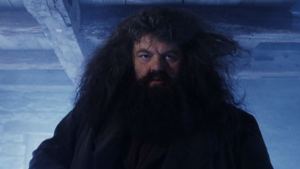 Which, yeah, this pretty much underscores how beautifully Hagrid was cast in the movies. Because this is a perfect summation of this guy! Hagrid’s dialect is thick in a way that’s a little grating to read, but Hagrid is just so very awesome that I’m willing to forgive him that. And it’s certainly very telling that he’s the most amazing person Harry’s ever seen–not only because he knows who Harry is, not only because he’s clearly capable of wonderful things, but also because he actually remembered his birthday and brought him cake. If I’d been Harry, I’d certainly have been blown away by somebody actually giving me birthday cake for once. Bonus that wizards have bottomless Pockets of Holding. Or perhaps the wizarding world has tapped into Gallifreyan pocket technology, because Hagrid’s pockets are obviously Bigger on the Inside. And, of course, we get the first big reveal: “Harry–yer a wizard.” But hard on the heels of that, Harry also finds out that a) the Dursleys knew, and b) they deliberately kept it from him, and furthermore c) his parents were killed by the evil wizard Voldemort. That’s a hell of a lot to drop on the head of a kid that’s just turned eleven. For that matter, it’s quite a lot for the Dursleys to have to deal with. Petunia’s outburst lays down exactly how wigged out she’s been by having a witch for a sister all this time, and it must surely have freaked her out to learn of the circumstances of Lily’s death. (Which, of course, we see more of later.) Here and now, all Harry gets to see is Petunia having an outburst in a way he’s never seen before. Likewise, Vernon puts up as much of a valiant fight as he’s capable of mustering. But he makes a fatal error: i.e., insulting Dumbledore in front of Hagrid. BAD. IDEA. Hagrid slaps Dudley with the spell that gives him a pig’s tail, and one just has to wonder exactly how much of a furor would have been raised if he’d succeeded in completely transforming the kid into a pig as he’d intended. And after all the backstory dump he drops on Harry, we get one last tantalizing hint out of Hagrid as the Dursleys flee in terror into the shack’s other room: that Hagrid isn’t actually supposed to be doing magic at all, and that he’d been expelled from Hogwarts in his third year. But that’s almost an afterthought, and is quickly forgotten as Hagrid whisks Harry off to the next chapter, and Diagon Alley! For the life of me, I cannot tell why the US edition would swap the period after “giant” for a semi-colon. It doesn’t add anything to the cadence of the paragraph, and in fact blunts some of the force of Hagrid’s actions. When Hagrid explodes at learning that Harry doesn’t know about the wizarding world, Harry protests in the UK edition that he can “do maths and stuff”. In the US edition, it’s “math and stuff”. Harry’s answer to the revelation that he’s a wizard is “I’m a what?” in the UK edition. In the US, the word ‘what’ has no italics. Which is another odd choice, given that the rest of the chapter hardly skimps on the italics-for-emphasis in the US edition. In other words, this is a word with North American origins being applied to a British wizard, which implies very interesting things about the worldbuilding here that Rowling may or may not have intended. The Harry Potter wikia doesn’t say much more than that, so one has to speculate as to what inspired Rowling to use the term. She might well have just liked the whimsical sound of it. The letter from Hogwarts also tells Harry in the UK edition that “you have a place at Hogwarts”, while the US edition says “you have been accepted”. The “31 July” date in the UK edition likewise becomes “July 31” in the US one. And I gotta say, the design of the US edition, at least in the ebook version I have, adds rather nice flair to the letter. There’s a swish underneath the header at the top, and Minerva McGonagall’s signature displayed as well. BOOM in French becomes BOUM. Same sound, different language’s spelling! Works for me! And as I pretty much expected, Hagrid comes across entirely differently in French. He’s not being written in any kind of dialect, and that all by itself changes the flavor of his dialogue completely. But I also see that instead of “Budge up, yeh great lump”, he tells Dudley in French, “Bouge-toi un peu”. Which is essentially “Move yourself a little”. On the other hand, Hagrid doesn’t hold back from calling Dursley “espèce de vieux pruneau”, which is more or less “you old prune”! New vocabulary word for me: “caoutchouc”, which is in the description of Hagrid bending Dursley’s rifle. It means “rubber”. The French translator plays with what Vernon mumbles when Hagrid roars at him. In English, Rowling writes it as “Mimblewimble”. In French, it becomes “Maisnonmaisquoimaispasdutout”. The translation used for “wizard” is “sorcier”, which was not the word I was expecting–given that I knew “magicien” from Bilbo Le Hobbit. “Sorcerer” has a bit of a different connotation in English than “magician” or even “wizard”; “sorcerer”, in English, is often negative. (Which makes the use of it in the US edition of the title of this book rather more interesting, I feel.) I do not, however, know if there’s a similar connotation difference for the words in French. Likewise, Lily is described in Petunia’s outburst as “une sorcière”. Dumbledore’s “Supreme Mugwump” title becomes “Manitou suprême”. Interesting because again, here, we’re using a Native American term. And here we get the use of the world “Moldu” for “Muggle”, as well. Which rolls off the tongue a trifle differently than “Muggle”, I feel, at least to my Anglophone ears! It’s not as cutesy-sounding. BOOM in German becomes BUMM! Fun with onomatopoeia! Interestingly, however, the “SMASH!” noise further down the page is “SPLITTER!” Not what I would have expected. Hagrid’s dialogue in German, unlike his dialogue in French, does seem to show a bit of dialect. The German translator shortens his ein and eine to ‘n and ‘ne, which took me a moment of looking to work that out. Some of his usages of es appear to be shortened to ‘s, too. THOUGH HEY: I also see Harry dropping a syllable off of Entschuldigung, turning it into ‘Tschuldigung. I think my favorite gigantic German word in this chapter is “zusammengeschrumpften”, which is “shriveled”, used in the description of the packet of crisps tossed into the fireplace. The aforementioned mutter of Dursley’s is closer to the English, in this edition: “Mimbelwimbel”. “Car crash” is “Autounfall”, which I actually managed to parse not only from context, but also because I’ve had “Unfall” as a vocabulary word in Supermemo. It means “accident”. Hagrid’s title in the German version is “der Hüter der Schlüssel und Ländereien”, which sounds so very delightfully German. “Wizard” here is “Zauberer”–and that I did know, again, from the German translation of The Hobbit. And for “witch”, we get “Hexe”. The German translator goes a little off on a tangent trying to deal with “Supreme Mugwump”. The translation here is “Ganz hohes Tier”, which, according to Google Translate, is “full bigwig”. So same idea, but losing that North American flavor to the word! “Muggle” here is almost the same word: “Muggel”. And Hogwarts is still Hogwarts. Next time: on to Diagon Alley!